Abu Dhabi Ports - the master developer, operator and manager of ports and industrial zones in the emirate – has seen a significant surge in cargo volumes during the first 10 months of 2015 compared to the same period last year. Container volumes increased 36 per cent at the Khalifa Port Container Terminal, which is operated by Abu Dhabi Terminals. The terminal moved 1,204,993 teu (twenty foot equivalent units), up from 889,165 teu in the same period in 2014. The busiest single month this year was October, when the port handled 157,673 teu. Roll-on-roll-off (RoRo) traffic saw a 29 per cent rise with 110,831 vehicles, up from 85,835 vehicles last year. In 2015, all RoRo operations were transferred to Khalifa Port from Zayed Port to meet growing demand from the automotive sector in the UAE. An enhanced yard and terminal facilities opened the door for increased customer services and provided strategic location and flexible capacity. This transition to Khalifa Port contributed to the upswing in volumes. 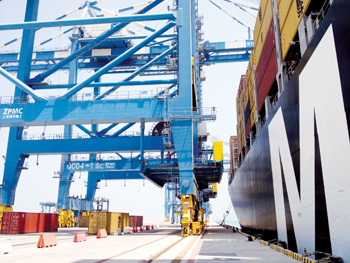 Currently, Khalifa Port offers capacity of about 350,000 vehicles a year. In the same period, general and bulk cargo edged up 20 per cent to 12,596,956 million freight tonnes (FT) from 10,469,374 million FT last year. “Our double-digit growth in all three cargo sectors, especially the top performance at our flagship Khalifa Port, has a special significance on the backdrop of a slowdown in the global maritime industry. Our growth is set to continue throughout this year,” said Captain Mohamed Juma Al Shamisi, CEO of Abu Dhabi Ports. “This proves the UAE’s stable economic condition, despite the new challenges that have re-emerged in the global economy. We accomplished this with the vision and guidance of our wise leadership,” he said. Major investments as part of Abu Dhabi Ports’ innovation strategy include the ongoing implementation of the Maqta Gateway, a new port community system interlinking all of the relevant parties involved in Abu Dhabi’s growing import and export trade business. This will significantly enhance processing times and communication procedures. Other investments in equipment and software upgrades have been made to improve productivity and efficiency. 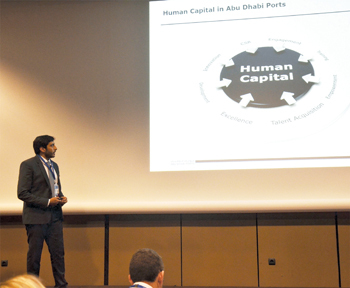 Meanwhile, two senior Emirati professionals of Abu Dhabi Ports, Maitha Al Murar, senior HR business partner, and Ahmed Al Khemeiri, talent acquisition specialist, were speakers at the HR Tech World Congress in Paris recently. Their topic was about the capitalisation of local talents and they spoke in the talent management session on the first day of the congress. In their presentation, Al Murrar and Al Khemeiri discussed the challenges in finding and attracting the right local talent with suitable skills and experience, and in developing and nurturing new skills, upskilling and reskilling talents. They shared Abu Dhabi Ports’ experience of overcoming such challenges. One of the world’s foremost annual conferences for leaders in human resources, the event was attended by delegates from over 80 countries. Sir Richard Branson, David Shing, Josh Bersin, and Jason Averbook were just a few of the prominent speakers. Established in 2006, Abu Dhabi Ports’ core objective is to facilitate the diversification of the economy by stimulating trade and development. This is done by delivering high-quality maritime services, supporting partners’ infrastructure projects and setting up new companies and joint ventures in the ports and logistics sectors. The flagship state-of-the-art Khalifa Port and Khalifa Industrial Zone of Abu Dhabi (Kizad) play a big role in supporting the diversification of the economy. Khalifa Port was inaugurated on December 12, 2012 by the UAE President, HH Sheikh Khalifa bin Zayed Al Nahyan. The port’s semi-automated container terminal handles all of Abu Dhabi’s container traffic after its transfer from Zayed Port, the historic port in the city’s centre. Phase One of Khalifa Port has a capacity of 2.5 million teu and 12 million tonnes of general cargo. Further phases of development will occur as market demand requires. When all phases are completed, Khalifa Port will be able to handle 15 million teu and 35 million tonnes of general cargo per year. Abu Dhabi Ports manages nine commercial, logistics, community and leisure ports, and Khalifa Industrial Zone which is serving a range of logistics and manufacturing investors. Abu Dhabi Ports is boosting Abu Dhabi’s economic growth and diversification in response to Abu Dhabi’s Economic Vision 2030.